The Asians have been very much interested in developing the domestic cars. Domestic in a way that they can run the errands pretty smoothly. Well, the Asian that we are considering here is South Korea. They are pretty famous because of the Samsung Galaxy and the Note series. But along with that, Kia has even earned South Koreans a lot of fame. Especially the domestic rides from Kia are pretty notable. Well, in 1999 Kia introduced the Carens. That was just after some series of developments with nothing new in it. This car earned some decent fame in Asia. But away from the Asian markets, it was struggling quite hard. Before the second generation came out, this car was discontinued in some markets already. Such as it stayed in the Australian market for just a couple of years. In 2006 the second generation Carens was introduced. It was displayed at the Frankfurt Motor Show as Carens. While at the Los Angeles International Auto Show it was introduced as Rondo. Well, that was the first time when Carens entered the North American market. Even in the Australian market, it was reintroduced as the Rondo. But this generation could not even leave a bright spark in the market. And by 2010 Rondo was discontinued in the United States. The third generation came out in 2013. This generation has quite improved than the previous two. And it even grew in the market response. Well, this gave a positive response to Kia and they made the Croods drive it. While for North America, it has been limited to just the Canadian markets. The cheapest version is available for as low as $25,880. And the model line is titles as 1, 2, 3 and 4. The Kia Carens get a variation in its drivetrain. There are a couple of gasoline engines and a diesel engine available. The base gasoline Carens comes with the 1.6 L 4-cylinder engine. It is a 138 hp drivetrain capable of generating 123 lb-ft of torque. This a common drivetrain that is found on some other Kia and Hyundai cars. Well, the next option is the 2.0 L engine. This is the powerful version available in the whole series. It is geared up with the Hyundai’s NU GDI engine having 174 hp of power and 157 lb-ft of torque. 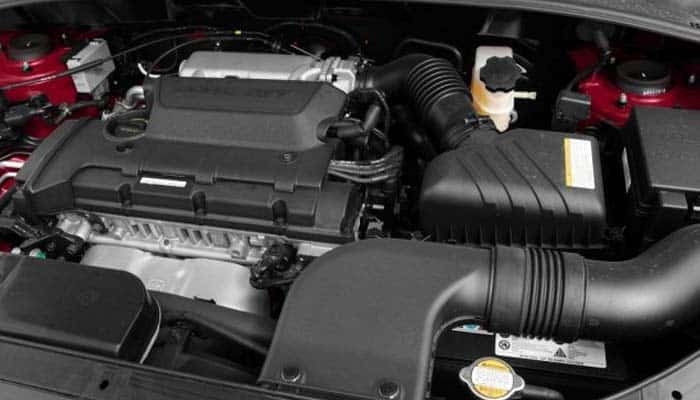 The Kia Sportage and the Hyundai Sonata Hybrid even features this same engine. Commonly this drivetrain comes mated with the 7-speed dual-clutch automatic transmission. When we step into the European market, we would certainly come across the diesel version of Carens. It comes equipped with the 1.7 L 4-cylinder engine making 134 hp of power at 151 lb-ft of torque. As with the rest of the drivetrains, this version could even be found in some other Kia and Hyundai cars. Bring performance out of the Carens is certainly impossible. Unless you get it re-detailed and plant in a different, more powerful drivetrain. This is a fuel-saving tech, preferably perfect for the families looking for an economical ride. Besides the performance, the handling is good enough for driving this car in the city. The steering wheel provides enough amount of jolt to the car to sway it along the sharp turns. And the barking is finely sufficient to stop this car immediately even over the fast speeds. 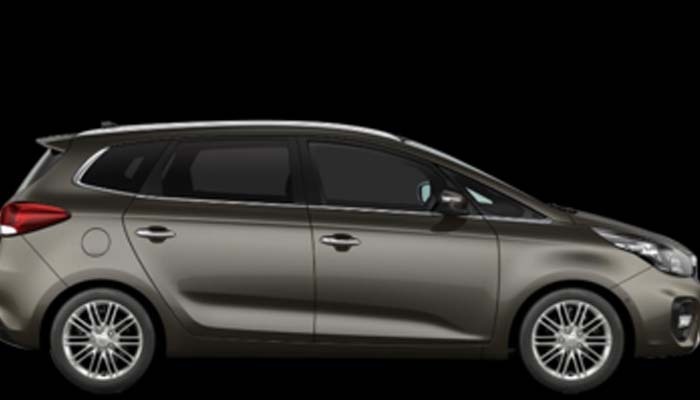 The Kia Carens is an MPV! Any doubt? It comes with the Kia’s Tiger nose, halogen lamps, LED DRL, fog lights, spoiler and the alloy wheels. The base model gets the 16-inch alloy wheels but not fog lights. 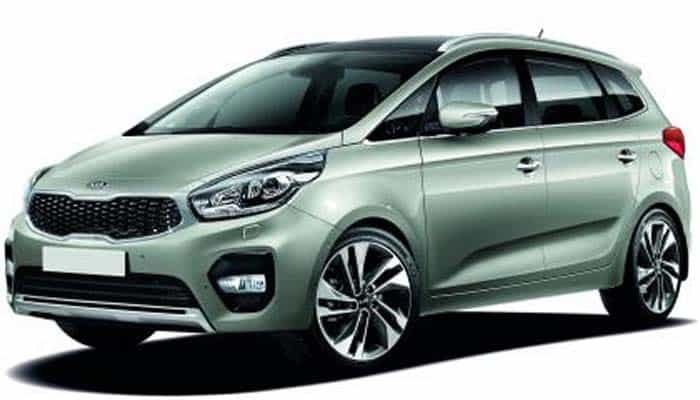 The mid-level Kia Carens 2 gets the fog lights and the roof rails while the rest of the design is same. The 3 has bigger 17-inch alloy wheels. And the 4 even gets the panoramic roof. Overall the Carens carry a decent design, good enough to make her an MPV! The base models of the Carens get the height adjustable cloth seats and manual air conditioning. The Carens 2 features black woven cloth seats with a Keep Clean Texture. While the top trims get the leather seats. Further, the Carens 2, 3 and 4 even get a faux leather trim, automatic air conditioning, and defog system. Further, the front row offers a sufficient space for seating. Even the second row is pretty generous in terms of seating. While the third row is just a kind of liability of this car. 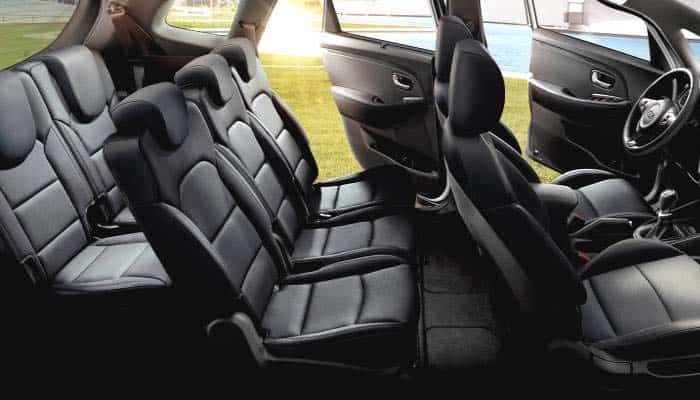 Ahead of that, the cargo space becomes pretty acknowledgeable upon folding the rearmost seating row. The Carens get the option for a 7-inch touchscreen infotainment system. It comes with the Apple CarPlay and the Android Auto. While the top-notch get the 8-inch touchscreen for the infotainment system. 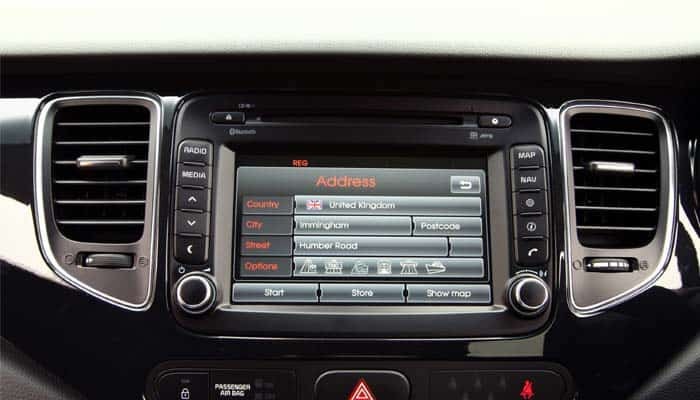 Further, this system features navigation, Bluetooth, telephony and USB connectivity. The multimedia options include the radio, DAB and the MP3 songs playability. The Carens grab some essential features for the passive safety. It gets the frontal airbags with the cutoff switch, adjustable seatbelts, adjustable headrest for all the seats, ISOFIX for children and the twin curtain airbags. Further, it even has the seatbelt reminder that tells you to put on the seat if you have forgotten. Besides the passive safety, the Carens even get a handful of active safety features. Like it features the parking sensors, hill start assist, ESC, ABS and tire pressure monitoring system. 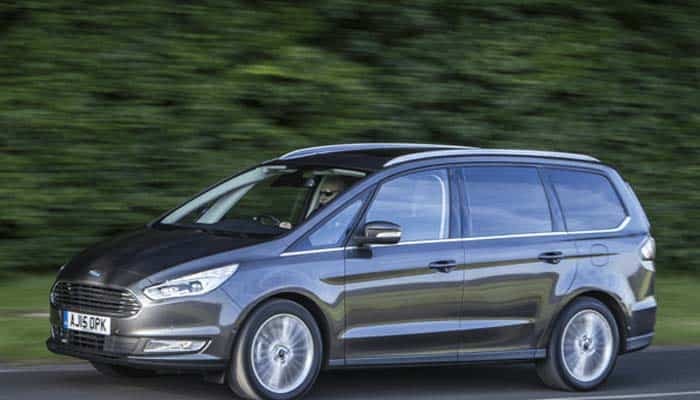 The Ford Galaxy is a bit larger MPV. 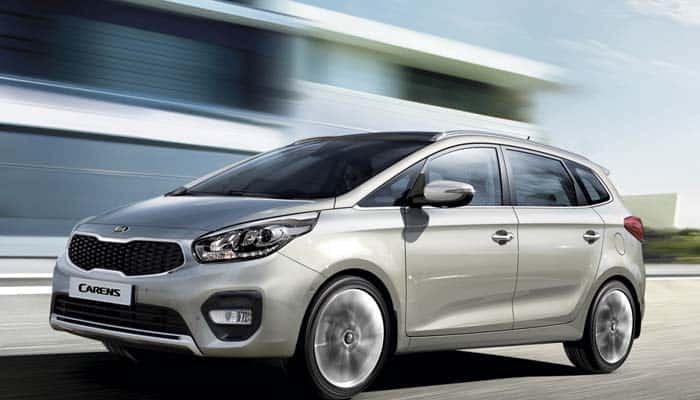 But mechanically it meets the Kia Carens in competition. Well, the spacing in Galaxy is quite sufficient. And that is where it succeeds the Carens. While the Carens have an attractive design. The Carens are not really packed with too much fun. But still, it really is a joy to ride this car. While the third-row in this car is just a liability.